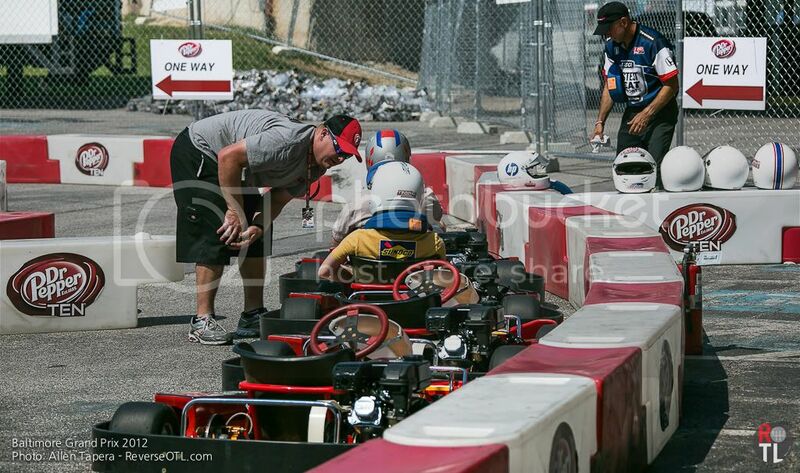 Reverse on the Left: Baltimore Grand Prix 2012: Sophomore Year. 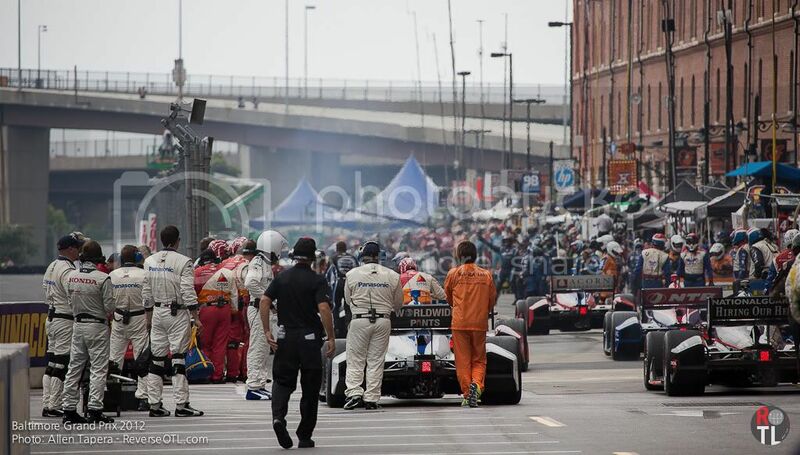 Baltimore Grand Prix 2012: Sophomore Year. Teams and drivers get ready to start the procession to the starting grid on Sunday. 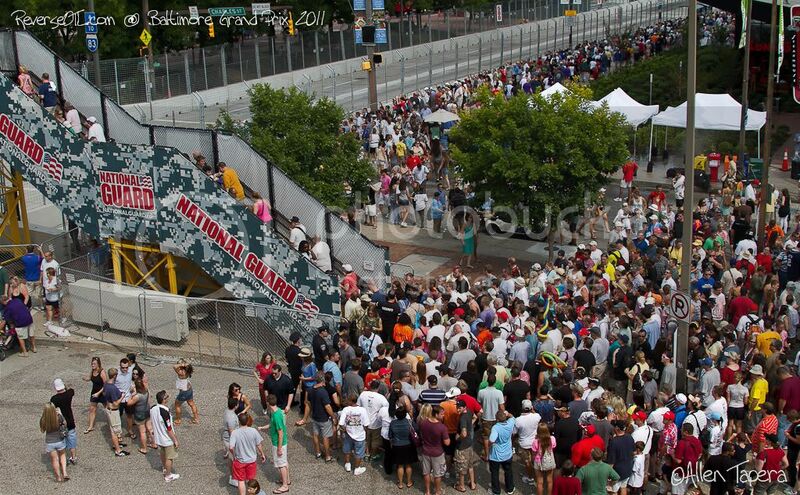 A lot has happened since the inaugural Baltimore Grand Prix (BGP) in 2011. The organizing body for 2011, Baltimore Racing Development LLC, essentially took the money and ran. Left in their wake was investor debt and serious doubts of an encore the following year. Fortunately for the event, Andretti Sports Marketing stepped in and essentially took what had been a nice car (ruined by it's new young owner), and sought to restore it. They took the neglected auto to the body shop, interior guy, and factory parts supplier in order to return it to former glory. The outcome was better than expected - the product was significantly improved compared to last year. University of Maryland College Park's marching band made a surprise visit. 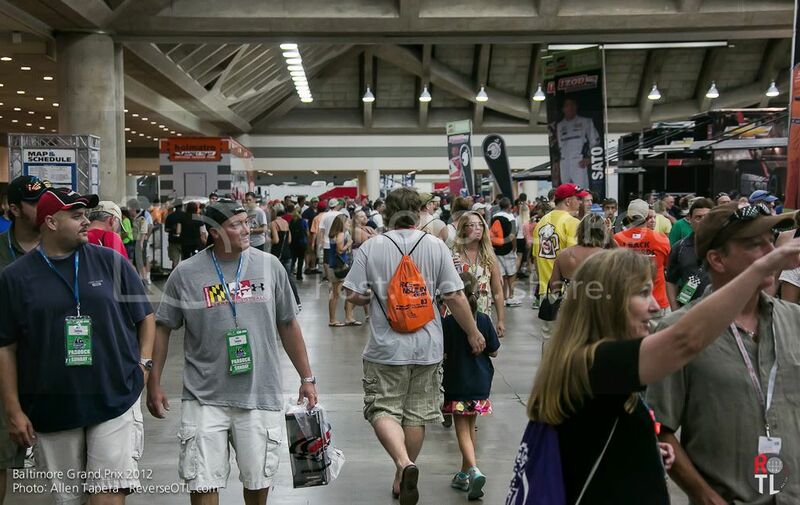 IndyCar Paddock inside the Baltimore Convention Center. When comparing the event layout of 2011 to 2012, there were minor tweaks all around. There weren't more bridges to cross the track during hot laps, but they were larger and allowed more people to cross simultaneously. Of course there were some bottlenecks on race days for IndyCar and ALMS, but nowhere close to the issues from the previous year. There were many more gates for entry onto the grounds as well; 7 gates allowing entry in 2012, compared to just 4 from 2011. While you may not think this matters much, when you find yourself re-entering the event and being greeted by a 100+ person line, you'd wish there was another gate closer than a half mile away. The grandstand layouts were changed a bit too, reducing seating in some areas, but increasing the size of the stands that remained. The broad strokes stayed the same; the ALMS paddock and IndyCar paddocks remained in their respective locations, which made navigating on memory (for second-time visitors) pretty seamless. 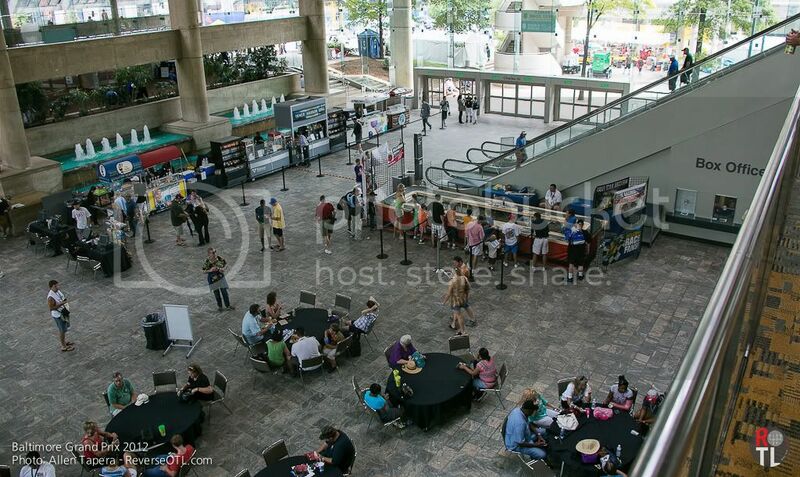 The family fun zone moved from just outside the convention center, to a large air-conditioned spot inside. This made perfect sense as the late summer sun was strong on Friday and Saturday. 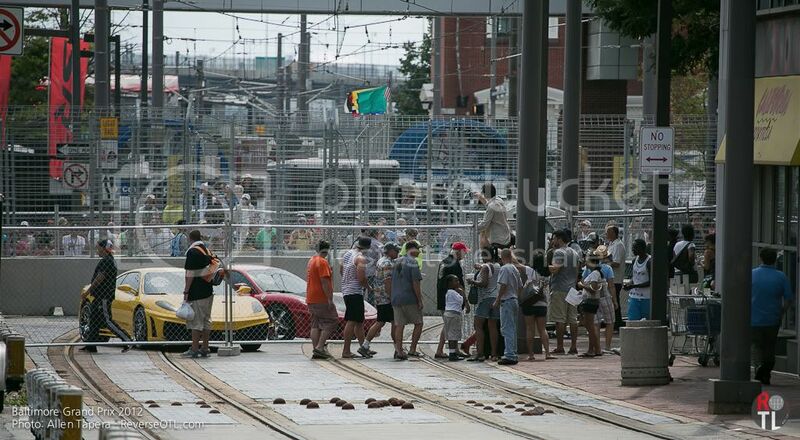 Motorsport fans line up to cross over ALMS paddock bridge before the race Saturday. The MARC train was still on time, but this loading zone was closed. 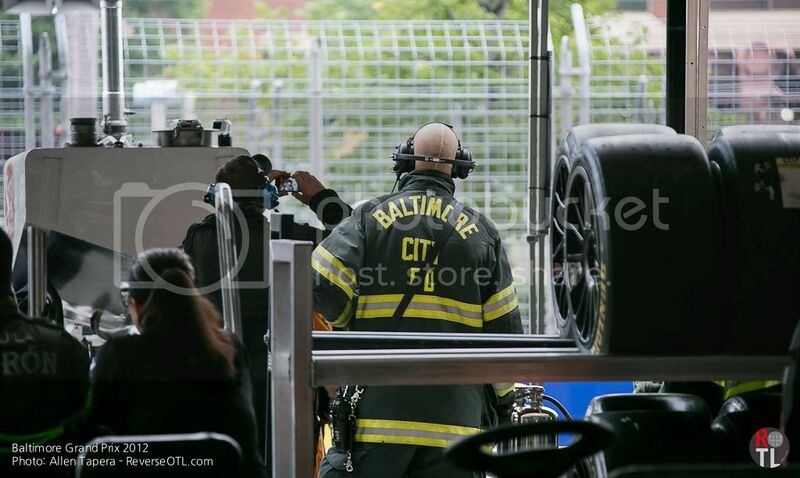 Baltimore's finest on duty for ALMS Round 8. 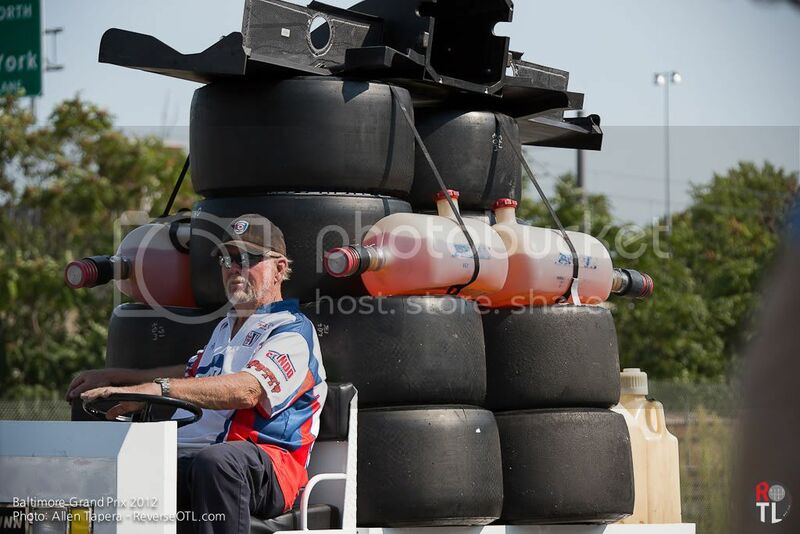 There were a variety of events around the BGP grounds to provide entertainment value. 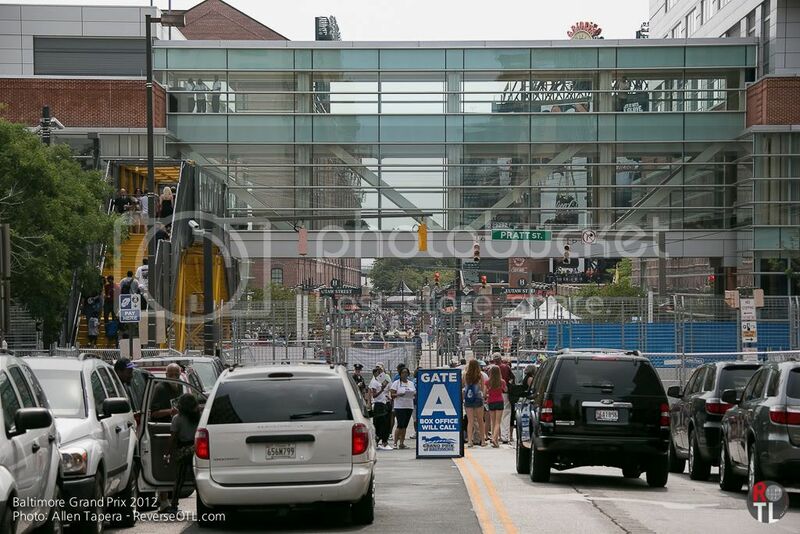 On the side of the Baltimore Convention Center, facing Camden Yards, there was a large stage setup for live bands throughout the day. 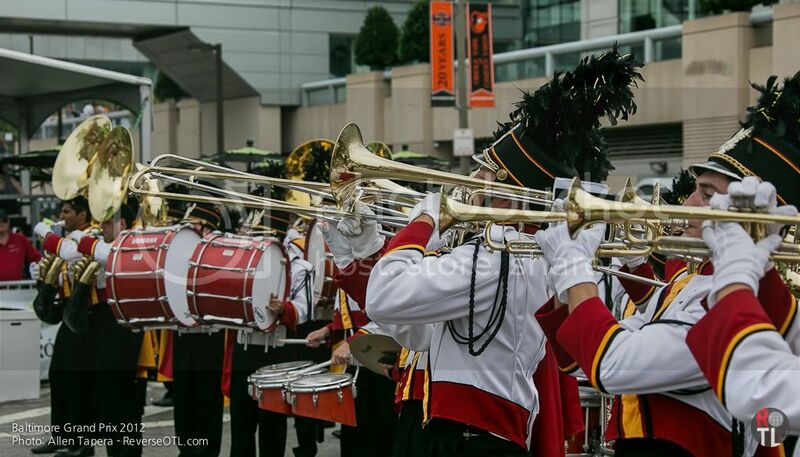 On Saturday afternoon the University of Maryland marching band had several impromptu performances. 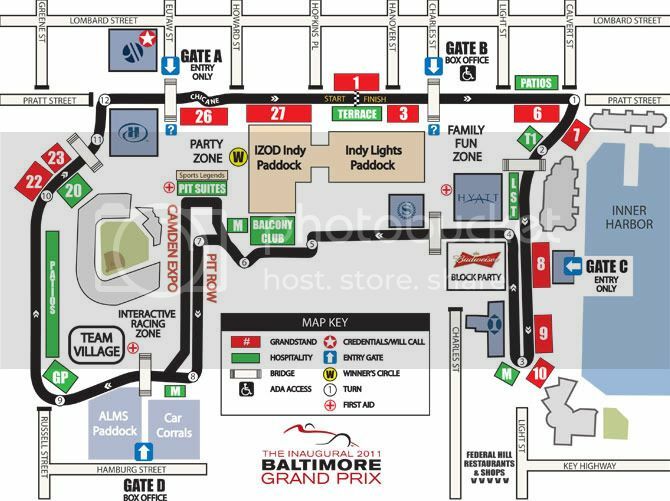 If you walked into the Baltimore Convention Center's lower level you got to the IndyCar Paddock, which also included both IndyLights and Star Mazda teams (IndyCar feeder series'). This was especially cool on Sunday, as you get to see all of the teams working out the kinks before the race gets underway. In the southwest portion of the grounds there's the ALMS Paddock area where the P1/P2/PC/GT/GTC teams have their trailers, tents and vehicles. One of the treats of being in the ALMS Paddock at the right time is seeing the cars entering the pits through the runoff area at Turn 8. I was able to catch the ALMS teams lining up for Friday's practice session, and got an up close and personal concert from all of the different powerplants and their respective exhausts. 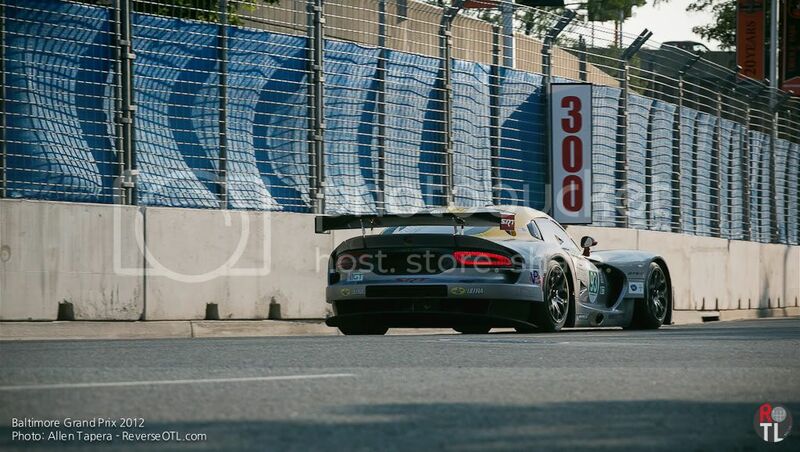 While the Patron sponsored Ferrari F458 Challenges screamed the loudest, the Corvette C6R's sounded the most brutal. Walking back towards the entrance the ALMS Paddock, there was a go-kart track for the kids and a welcome surprise in the form of a small booth with the word 'McLaren' printed on the tent. McLaren brought a single MP4-12C down to the BGP to get it a bit more exposure. 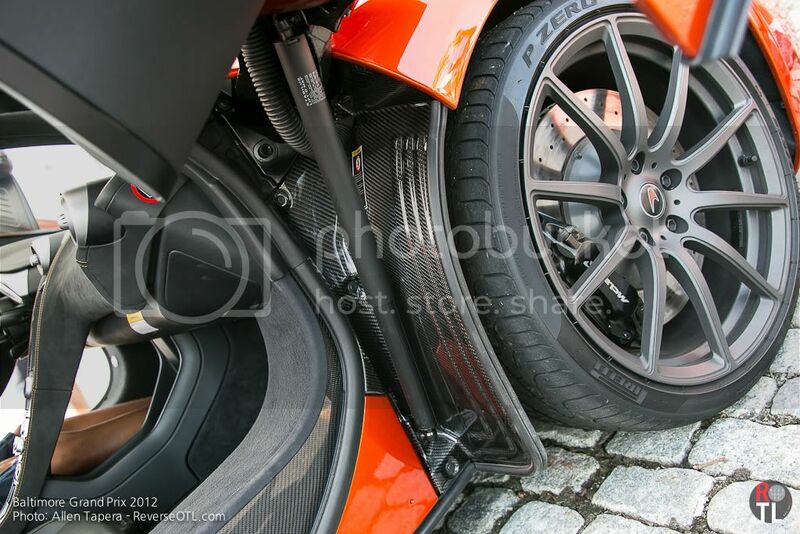 Seeing the craftsmanship of the MP4-12C's carbon-fiber monocoque in person, alone, was worth the price of admission. This pushrod nightmare sounded mean, but finished second to a flat-six. 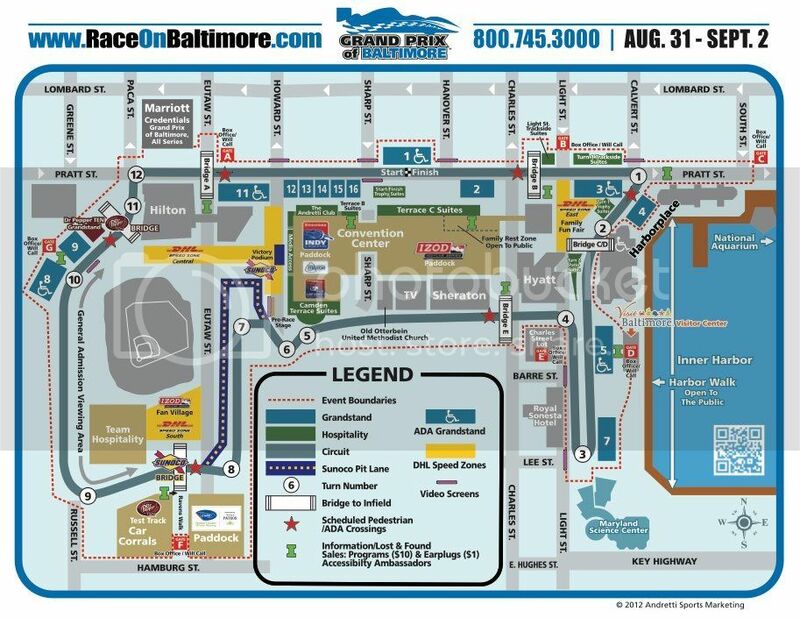 The Baltimore Grand Prix's Inner Harbor street circuit remained essentially unchanged in 2012. There were small changes to the flow of turns 5 through 7, but the infrastructure established in the inaugural event and topography of the city just about dictated current course layout. 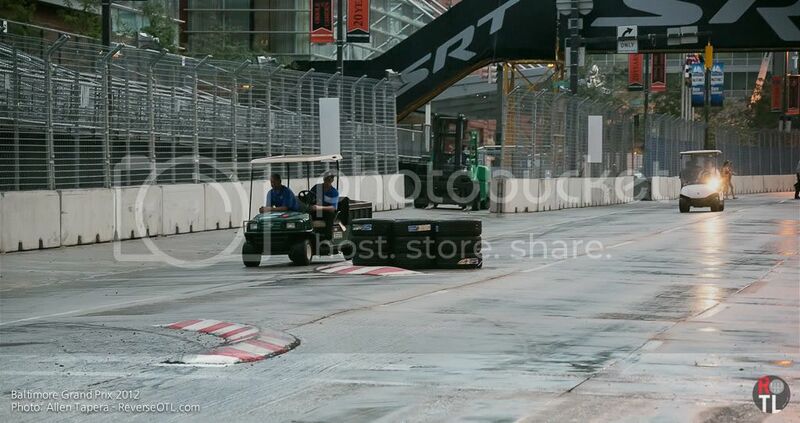 When you look at the front straight on the new map, you don't see any mention of the chicane used to keep cars from going too fast over the light-rail tracks crossing Pratt Street, but don't be mislead; it was there once again, but simply executed better. 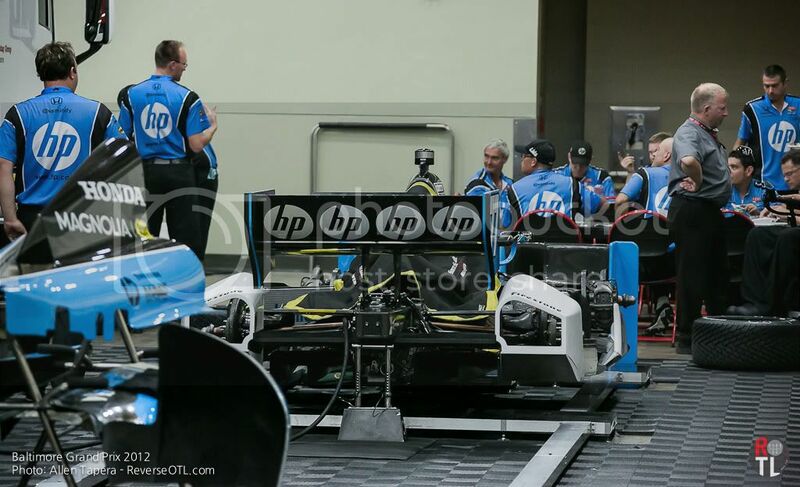 During ALMS qualifying and practice the race officials played with a number of options, and settled on a chicane similar to last year's but with the addition of bounded tires on the chicanes' entry to keep drivers from straddling it. 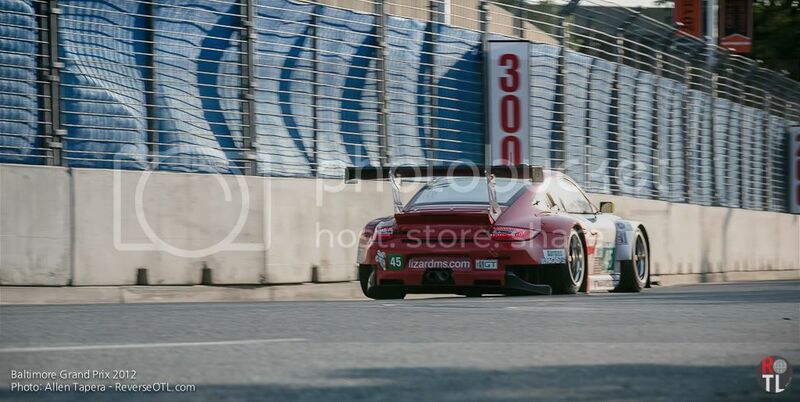 What usually happens, as the drivers are getting acclimated to the chicane, is an entry speed too fast to make the chicane exit after successful entry. 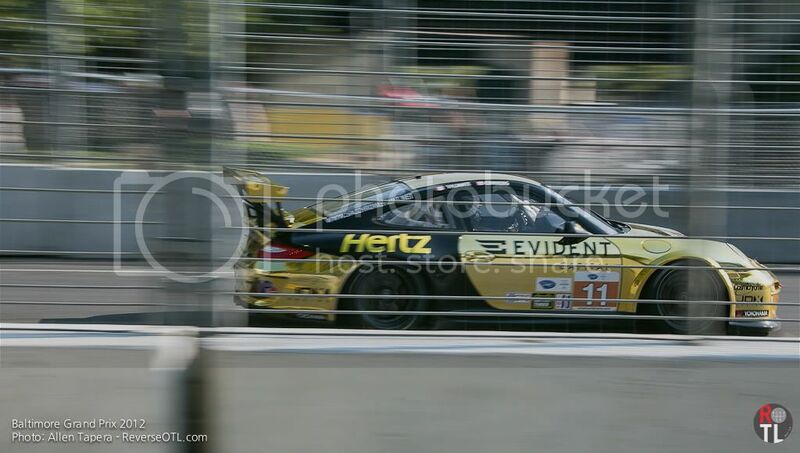 The result of getting this part of the track wrong is damaged under-body aero, on the crowned tarmac, and/or putting the car into the jersey barrier after a sloppy chicane exit. Even with the tire stack and chicane there was more than a handful of ALMS and IndyCar's that hit the barrier after the aforementioned chicane, in most cases due to severe suspension rebound and loss of traction. 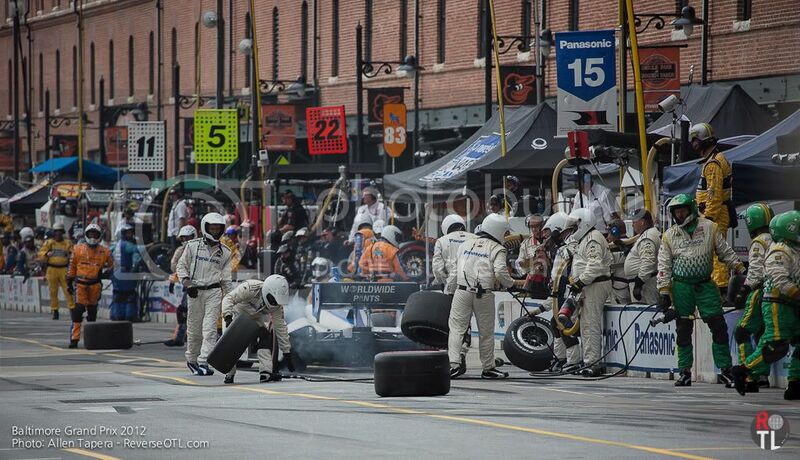 Pratt St. chicane semi-broken down after ALMS race Saturday evening. Flying Lizard Motorsports' GT3RSR builds the pace during Friday practice. 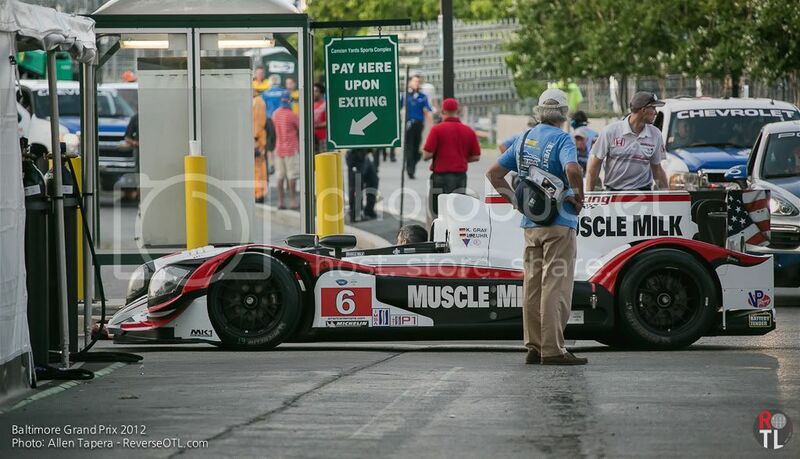 In addition to the bouncy landscape surrounding the chicane on Pratt St., which claimed the cars of Tony Kanaan and Simona De Silvestro during IndyCar Round 14, the drivers had to be on their game on just about every corner. 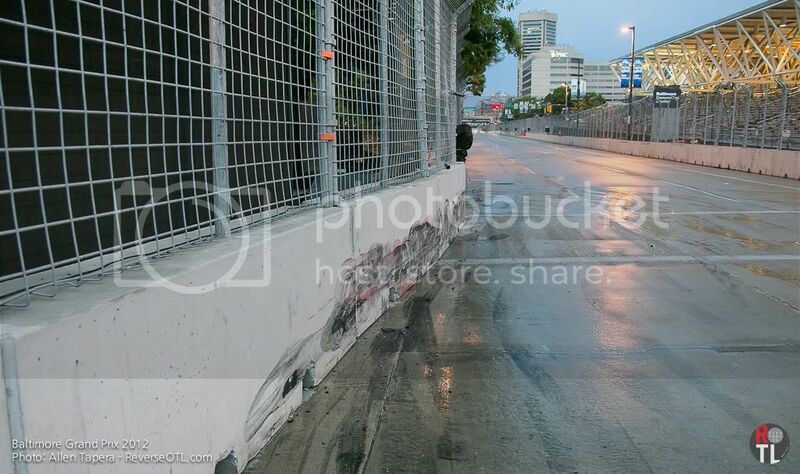 The tire barriers on turn 4 collected more than one car during the IndyCar race and yellow flags were an almost predictable occurrence all weekend. Street courses rarely give a lot of room for passing, so qualifying positions proved essential for the IndyCar and ALMS races. The streets we locals use to cut through downtown Bmore were as bumpy as ever, leading to both improperly and properly set up cars to skate all over the place. The cars that succeeded here were those who were set up to be compliant and neutral, with a driver whose fire suit contained the cojones to push the limit of braking zones to pass regardless of available grip. The SRT (Dodge) factory racing team, running two brand new Forza Motorsport SRT Viper GTS-R's, learned about the deficiencies of their chassis the hard way. The #93 car took a beating in its third ALMS race of the year (primarily from playing bumper cars with the Patron F458 Challenge car), while the #91 car retired after a weekend-ending accident during practice. The worst part about the tricky track conditions was the sheer volume of caution laps due to race incidents. 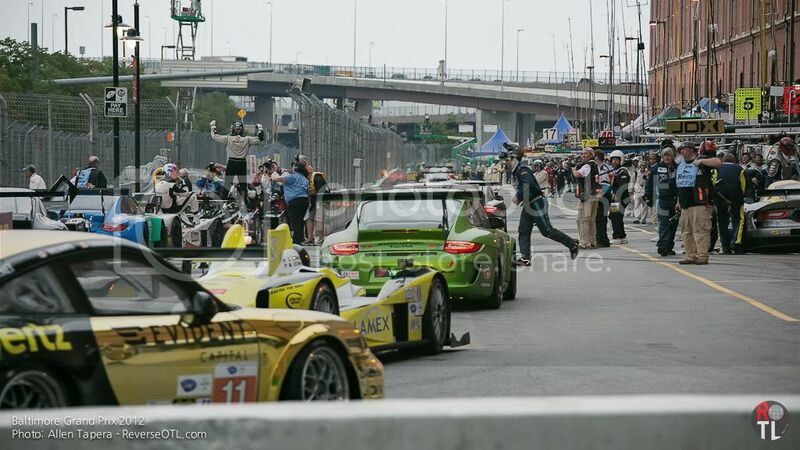 In the end, the ALMS race felt like it finished under caution; about 1/4 of the race was run with the Porsche Panamera pace car leading the field. Takuma Sato takes off after a tire change. Pickett Racing's Muscle Milk P1 car returning to base after practice. 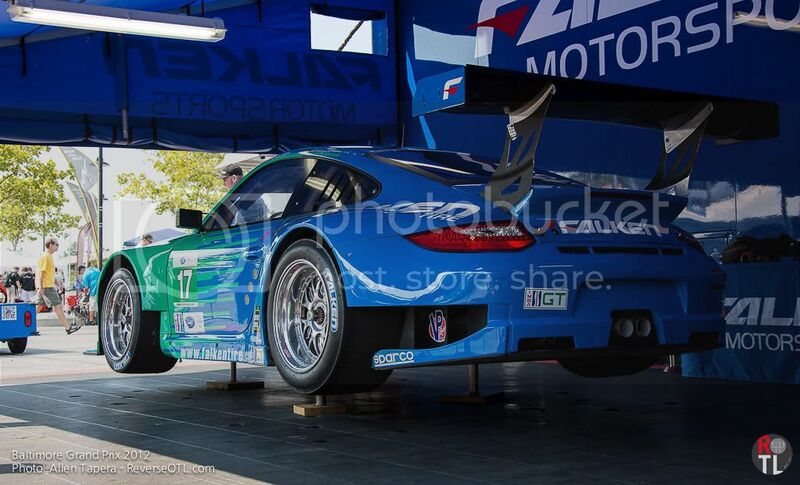 Falken Motorsports' GT3RSR getting prepped for the first drive of the weekend. Level 5 Motorsports' P2 driver celebrates the overall ALMS victory. 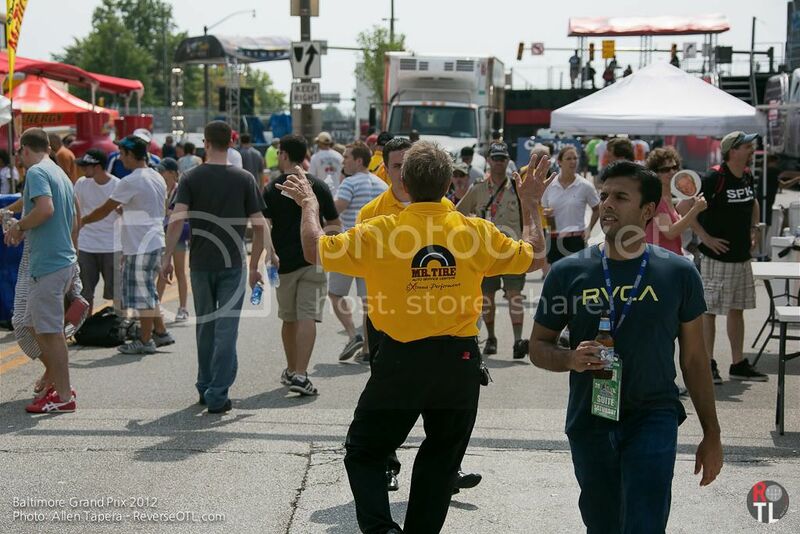 From our correspondence with the marketing group, entering the gates, dealing with security and staff around the event while working, and general atmosphere from fans and drivers, the entire weekend was pretty orderly. 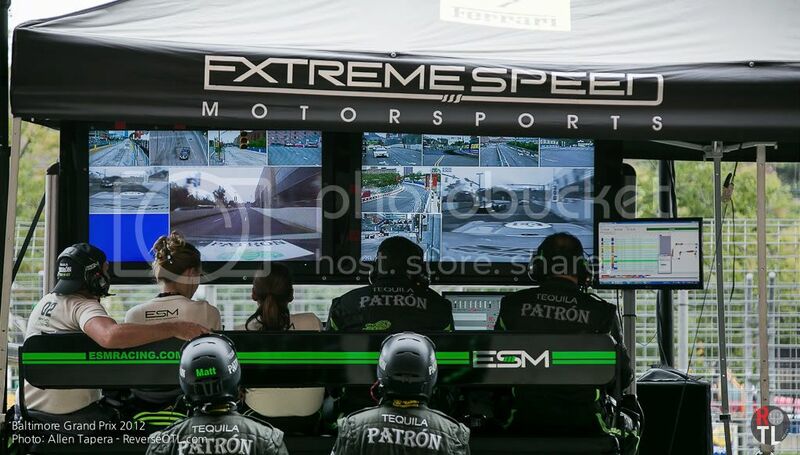 There were the typical issues with security, concerning access (not just us -- for full-time media with access too) during races, but nothing out of the ordinary for a race event. On the whole, we felt the entire weekend was run much better than last year. The staff and security seemed sharper and better aware of what was going on around them. Walking around the grounds wasn't the headache it was last year, especially during races. Some of this improvement was due to the lower turnout this year, but as with all new events turnout consistency comes with (quality) repetition. When you know a destination is going to be enjoyable, you'll want to visit again. When you know an event will be there year after year, you can plan on attending in advance. When people can plan on attending in advance, you have consistent turnout. 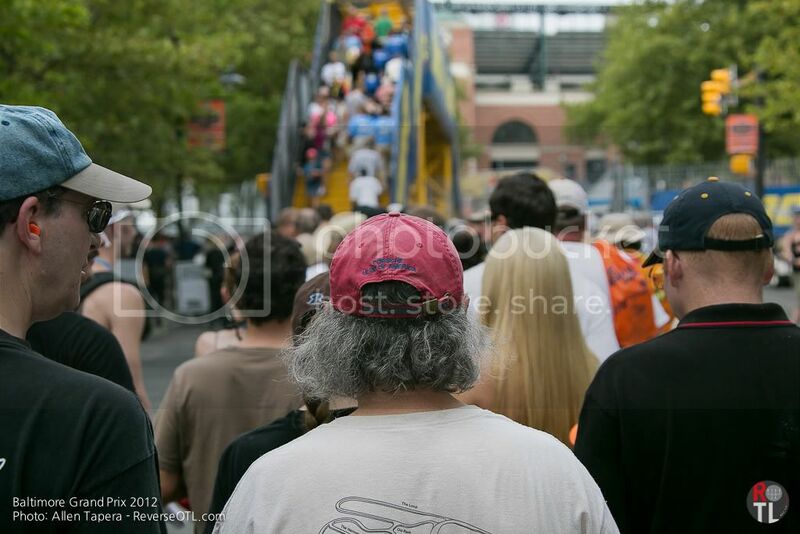 And if you haven't noticed already, the 2013 Baltimore Grand Prix is already scheduled. Gettin' down outside of the Mr. Tire booth. 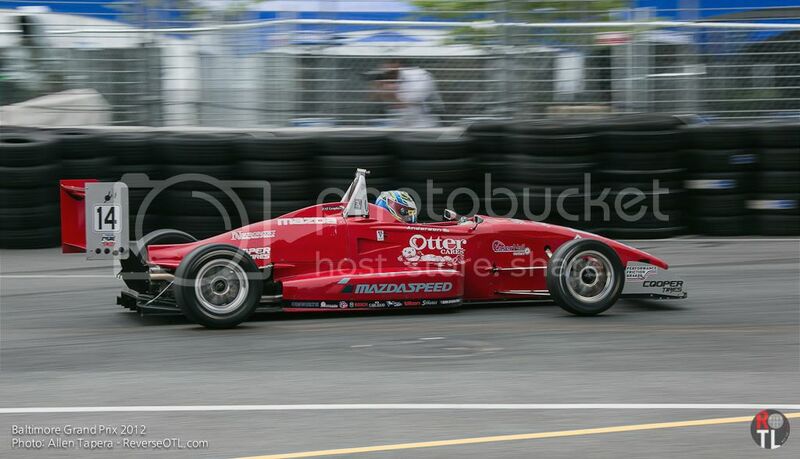 Star Mazda series race on Sunday morning. 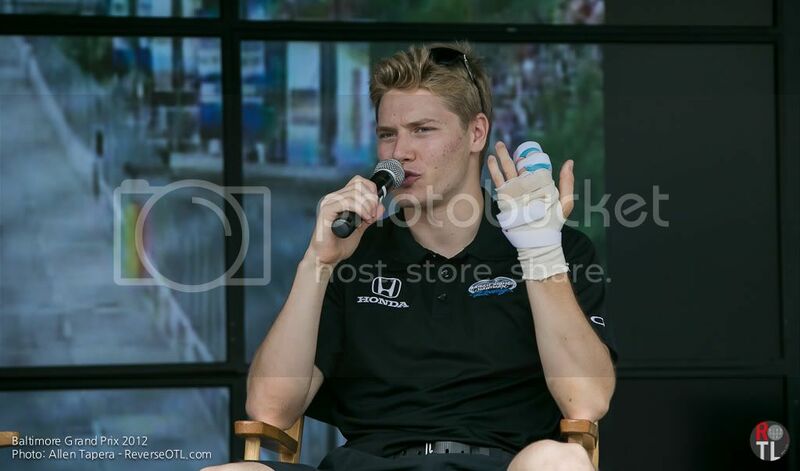 IndyCar interview with Josef Newgarden in the IZOD Fan Village. Josef was recovering from a hand injury suffered in the Grand Prix of Sonoma the week before. 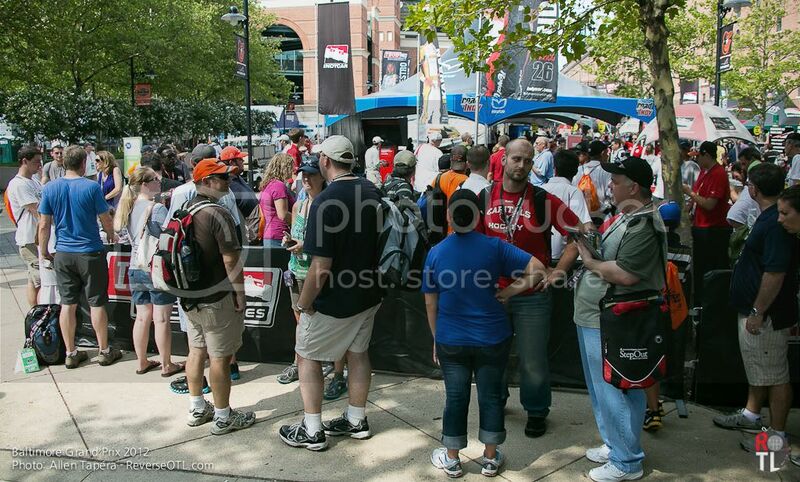 Long lines for autographs with the young talent of IndyCar. 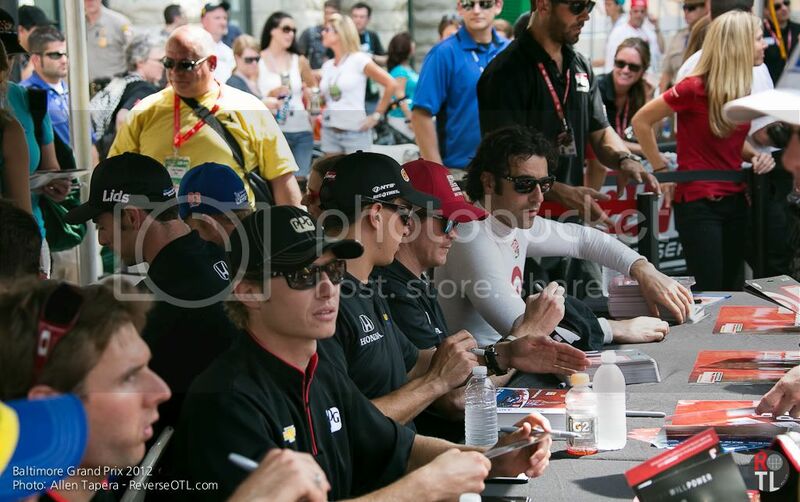 From left to right: Will Power, Ryan Brisco, Graham Rahal, Scott Dixon, Dario Franchitti. I'm looking forward to next year's event for two reasons. For one, road-racing makes my world go round. More importantly though, I'm hoping the overall turnout is closer to year one. Reason being, I want the BGP to be a profitable, stable, dependable enterprise. However, I don't want to revisit the attendance catastrophe of the first year. There were media outlets stating 'sophomore slump' before the weekend was even over, but I don't think it's reasonable to expect the same (or bigger) turnout after all that followed the inaugural event. Most of the grandstands were full for the IndyCar race on Sunday, but for the ALMS race on Saturday, the seats had noticeable gaps in them. From walking around the grounds Saturday it seemed more people opted for the general admission viewing areas (see map) and spent more time on the infield or lined up on fences to watch the action. People were even stopping their cars along I-395 to get a better vantage point. The overall number of people around the grounds all weekend seemed to be down about 20% from 2011. 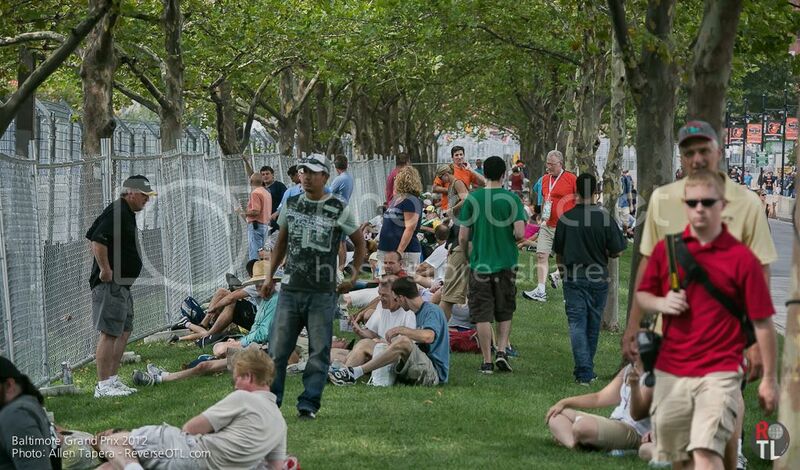 The benefit was a noticeable ease in which you could walk from one part of the grounds to another. 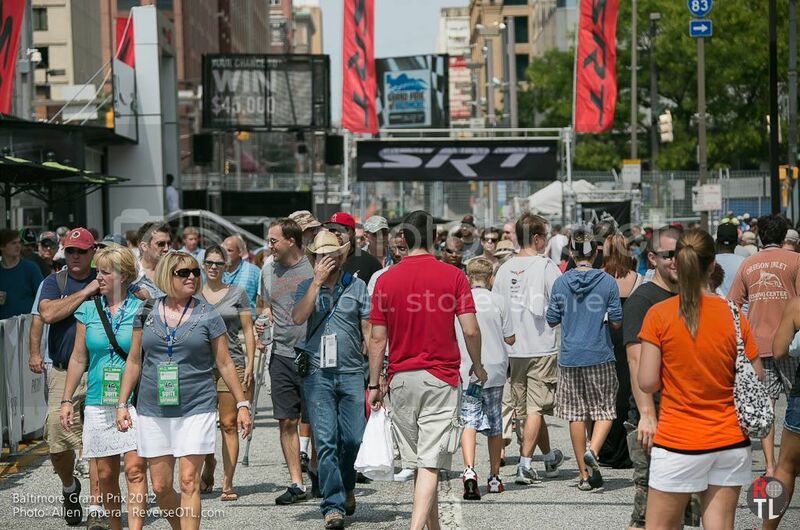 Compared to the human traffic jam on IndyCar Sunday in 2011, this was a welcome change. Outside of economic reasons, there are a lot of auto-enthusiasts I know that couldn't make the BGP due to traditional friend/family outings that have always taken place on Labor Day weekend. The question that remains is if the BGP can turn into a traditional event for greater Mid-Atlantic area piston-heads. Only time will tell, and hopefully I'll be there to find out. Current image set here. Video clips here.